Sandys romped to a 7-0 victory over Tranent to get their hands on their first piece of silverware this season in the Challenge Cup final at the Oriam on Friday night. The Castle View club are bidding for a stunning quintuple with three cup finals to look forward to, while they are still competing for the Premier League title. Kev Stewart got them off to the perfect start inside two minutes when he latched on to Bob McKenzie’s through ball to score past the Tranent goalkeeper. It was 2-0 after ten minutes when McKenzie drove at the Tranent defence and slotted the ball home to put Sandys well in the ascendancy. Gordon Ramsay put them further ahead when he volleyed a terrific strike into the top corner from the edge of the box. McKenzie had caused Tranent all sorts of trouble in the opening period and that theme continued after the break as he scored his second, skipping his way past several defenders and finding the top corner. Andrew Kidd made it five from the penalty spot after McKenzie had been fouled, and Paul Mercer added another with a fine individual goal. McKenzie secured his hat-trick after being fouled in the area. With penalty taker Kidd off, McKenzie stepped up and made no mistake. 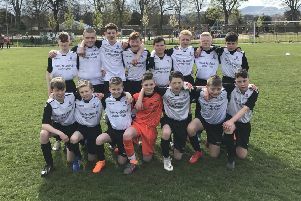 Free-scoring Bob McKenzie would secure another three goals on Sunday as Edinburgh East lifted the IME Cup with a 5-2 triumph over Lauriston Thistle. East took the lead midway through the first half when Ryan Taylor’s strike took a deflection off Tam Crease and ended up in the back of the net. McKenzie would go on to score two to put East 3-0 ahead and cruising at the break. Lauriston pulled two goals back to make it 3-2, with East goalkeeper Jordan Richardson preventing them from equalising with some fine saves. McKenzie ensured the trophy would be East’s, however, as he netted after an excellent solo run, Michael Osbourne completing the scoring when he headed in Sean Aitchison’s cross. Vittoria Group AFC rounded off their 2017/18 Sunday Morning Division 1 campaign in style with a 4-2 win over Broxburn AFC. Matteo Margiotta fired the home side ahead early on with an exquisite curling finish into the top corner, but Broxburn soon pulled level. Vittoria goalkeeper Tom Barbour pulled off several great saves to keep the visitors at bay, before Luigi Pia put Vittoria 2-1 ahead with a cracking strike from distance. Broxburn levelled before the break, but Vittoria captain Tommy Ambrozy took his season’s tally to over 30 goals with a double.